Donor photo and first/last name. Click the photo to upload a new image manually; double click first/last names to edit. Quick notes. Quick notes are not visible to donors, but will be visible to all admins who have access to the Donation + Extended payments module. 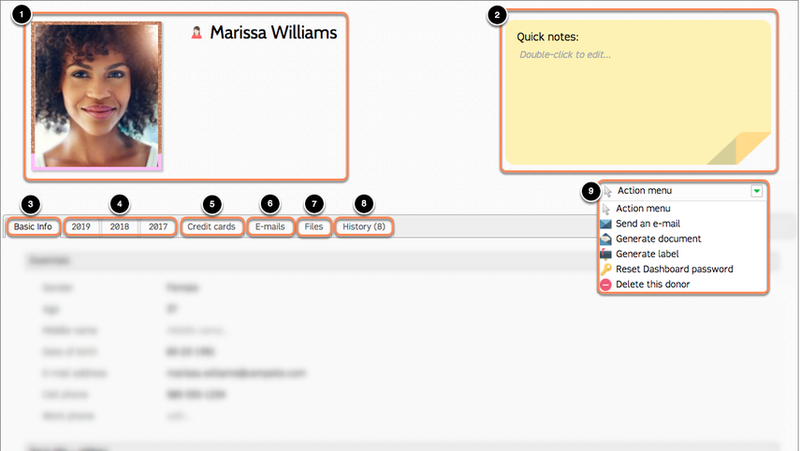 Double click the to add/edit quick notes. Yearly information (i.e. payments/donations and custom fields). E-mails sent to this donor. Files uploaded by an admin. History log of changes made to the donor's account. 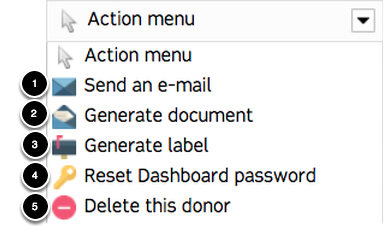 Action Menu, which contains all of the actions that an admin can take towards this donor's account. Send an e-mail to this donor. Generate a saved Donor document for this donor. Generate a saved Donor label for this donor. Reset the donor's password used for logging into their Donor Dashboard account. Permanently delete this donor (and all associated records) from the database.